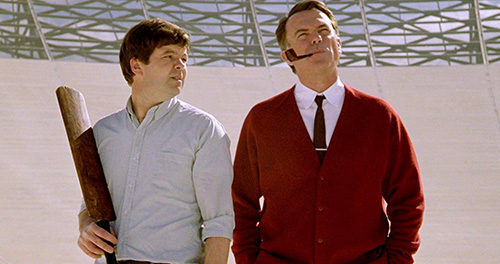 Sam Neill headlines this true story about a small Australian community that played a key role in the 1969 Apollo moon landing. Neill plays the manager of the Parkes radio satellite observatory, home of the largest steerable parabolic antennae in the southern hemisphere. The small team at Parkes worked with NASA to receive television signals from the moon and distribute that signal across the world. Without Parkes, we would never have seen Neil Armstrong and Buzz Aldrin walk on the moon! Not too shabby for five blokes working at a satellite in the middle of a remote sheep farm. The Dish is a sweet, fluffy little movie that sheds light on an over-looked aspect of an historic event. It’s about small-town, rural folk with something to prove to the world, their pride at being asked to help NASA, and their struggles to live up to the promise. The team encounter a black-out that wipes out their computers’ data, busy-body visitors, and inclement weather to receive the the all-important signal. And the weight of the world is not only on Neill and his team, but on the town’s mayor (Roy Billing), whose hosting visits from the American ambassador as well as the Australian prime minister. Human drama helps ground the historical narrative. One of the satellite workers is a nervous man working up his courage to ask a gal on a date, while another feels he has something to prove to an American comrade (Patrick Warburton). While I wouldn’t call the movie a laugh-out-loud comedy, there are a couple of humorous highlights. My favorites involve a belligerent teen band who plays the theme from Hawaii Five-O when asked to play the American National Anthem, and a scene in which two of the satellite team impersonate the Apollo 11 team via radio so the visiting ambassador won’t know they’ve temporarily lost Apollo’s signal.